If you happen to be near the borderline between Italy and France, and if you are a garden lover, do not miss the chance to visit the Hanbury botanical garden. Located on the Capo Mortola promontory, it extends on a 18 hectars area, half of which is cultivated with both tropical and subtropical plants coming. They come from several zones on the planet where there is a Mediterranean climate. 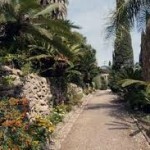 The other half of the place contains self-vegetation which usually grows in the Mediterranean area. This is pretty curious actually, since the promontory as a very mild climate, especially in winter, when temperatures seldomly goes below 0°C (which means 32°F).